Roger Kuin's Chamber Music is a playfully written, imaginative, and ultimately demanding book, with a critical approach characterized by an unusual and indiosynchratic post-modern critical style that will challenge the reader's perceptions of what a book of criticism should and can do. 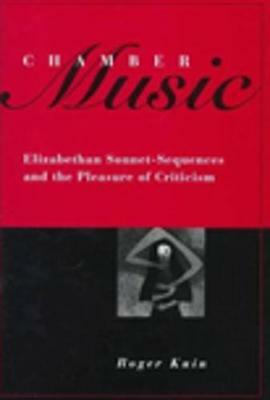 Analysing the sonnet sequences of Sidney, Spenser, and Shakespeare both from an interpretive angle and from the perspective of a post-modern re-evaluation of the Renaissance sonnets, Roger Kuin's discussion is influenced by many modern literary critics, including Roland Barthes and Umberto Eco. Kuin focuses on the problems inherent in the form of the sonnet sequence, emphasizing the various forms of indeterminacy central to their meaning. His sense of the intertextual relationship among the major English sequences is subtle, and in places, strikingly original, in combination with a highly sophisticated understanding of theory. Chamber Music is a book that will infuriate many, but ultimately reward those who flow with its idiosyncratic style towards Roger Kuin's admirable and expert conclusions.